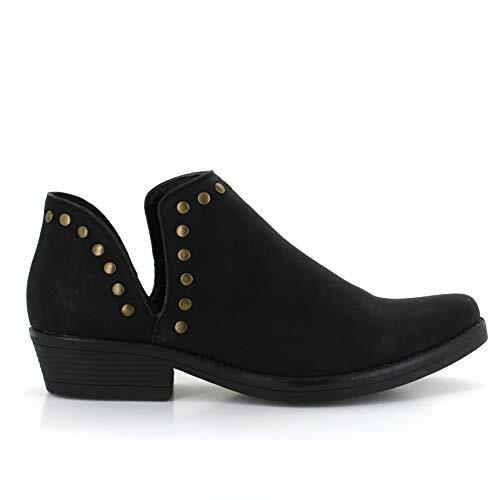 Looking for a pair of vegan ankle boots? You're in the right spot. Here are 10 pairs that you can wear for a variety of occasions. 7. Unisex Red Plaid Creeper Combat Boots with Pointed Toes by T.U.K. Autumn is plaid season, and this women's ankle boot is doing it right with big, bold checks of beige, green and red. Styled with a pointed toe and a mod, square-shaped heel. Comes up just over the ankle. Fastens on the inner side with a zipper. Easily wiped clean with a cloth. Advertised as vegan: No, but these boots are all textile and rubber. Pros: Plaid is back in a big way, so you'll have your finger on the fashion pulse in these. Wear them with vibrant colors, especially red, yellow or emerald green to complement the subtle shades in the plaid. Cons: These may have padded interiors, but the product description makes no mention of them, so we can't be certain. Men's or women's modern, eco-friendly Japanese ankle work boot made of black canvas and recycled rubber. Cotton canvas is water-resistant, light-weight and naturally breathable. 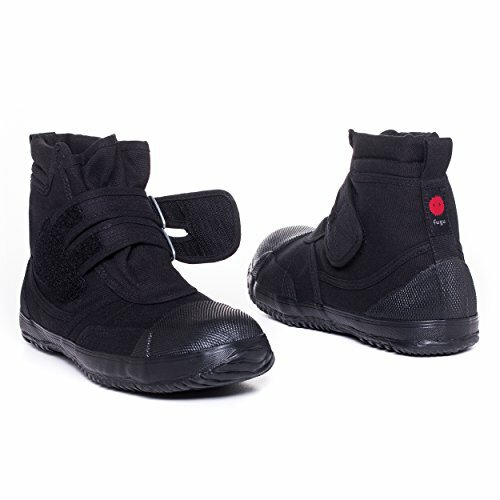 Boot is secured with a Velcro strap across the front. Sole is super flexible and slip-resistant. Designed to help alleviate back or knee pain. Pros: Go ahead and pamper your feet with these light-as-air boots. They're a fresh look for jeans or leggings with their Converse/high-fashion appeal, and they're plenty durable — should last through lots of wear without much tear. We may have found the ultimate fashion/work/leisure boot hybrid. Cons: They're just getting into the expensive range of boot prices. 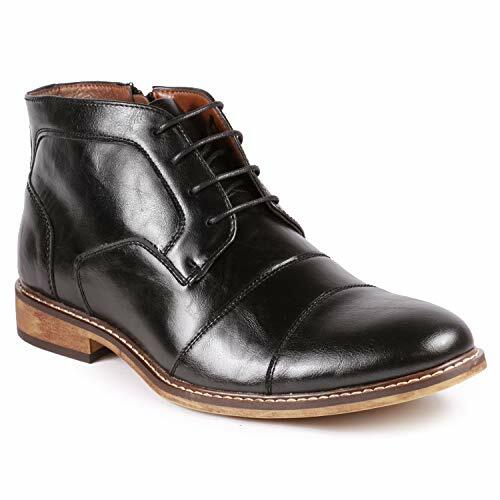 This shiny black oxford boot features beautiful stitching detail, a cap toe and a lace-up front. Boot zips up on the inner side for simple functionality. Low-heeled rubber sole has layered shades of brown with a lovely wooden appearance. White top stitching around the brown sole blends seamlessly with the black upper. Advertised as vegan: No. However, these are synthetic boots made to appear leather-like. Pros: Inexpensive footwear for the office or a dinner date. Should be reasonable in various weather types, possibly including light rain as synthetic leather tends to be at least somewhat water-resistant. If you've got a day off and want to look extra sharp, match them up with a t-shirt, a vegan moto jacket and slim jeans. Cons: We can't tell if these offer any inner padding. Fabulous, PETA-approved women's open toe ankle bootie in brick red vegan suede with a split shaft on either side. The boot top is joined together with a wraparound tie that fastens at the back of the ankle. Stacked heel is 3.25" and looks like genuine wood. Comfortable with a lightly cushioned footbed. Pros: These pretty, high-quality vegan suede booties are summer-ready, and that split shaft ankle is so chic. There's not much you couldn't wear with these, but we can especially see strong patterns, form-fitting tops and jean shorts in the mix. Cons: They're a tad pricey. Ladies' uber casual, comfortable ankle boot with a white textile upper and black lace overlay. Material is water-resistant, stretchy and form-fitting to hug the contours of your foot. Black polyurethane sole is nice and grippy on the sidewalk. Has a cushiony textile insole and special arch support system that won't wear out. Pros: Made for play in rain or shine, a comfortable, water-resistant pair of ankle boots like these will help keep you on your feet all day without even feeling it. Great for long strolls through the park or just being out and about, especially if your feet are prone to bunions, aches or pains. Cons: Many reviewers have reported that the arch padding is quite high, which is great if you're looking for lots of arch support, but not so much if you don't need all the extra boosting. 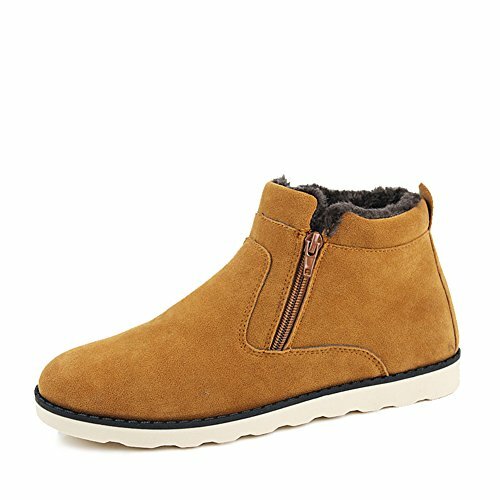 Functional and totally stylish men's brown ankle snow boot with dark gray faux fur lining for warmth and luxurious comfort. Secured with snappy zippers running diagonally along the sides. White rubber sole has an anti-skid construction for safe stepping. Material is waterproofed to hold up in the snow. Advertised as vegan: No, but all the materials are synthetic. Pros: Different is good with these snow boots designed for a sleek, street wear appearance. Snuggle up in the soft faux fur all winter long because these look first and foremost like trendy, fashionable kicks to go with jeans and your best flannel. Cons: Probably not meant for heavy snow conditions or really rugged terrain. 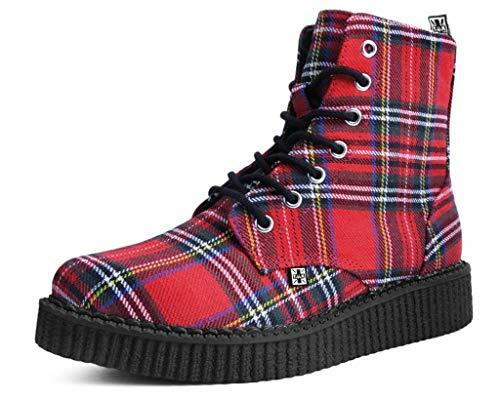 Excellent unisex creeper/combat boot combo in classic red tartan plaid. Toe is uniquely pointed and adds an unexpected gracefulness. Tightened with a black bootlace through silver metal eyelets. Black textured platform sole is .75" in the front and 1.25" in the back. Inner side zipper helps you in and out of the boot in a flash. Advertised as vegan: Yes. T.U.K. specializes in fresh vegan footwear. Pros: Plaid isn't just for punks, and these are made for anyone and everyone. Rock this pair with distressed jeans to a show or with a drapey tie coat to the boutiques. These boots probably make decent year-round footwear (except in super cold, snowy winters). Cons: Definitely a financial investment. A down-to-earth cowgirl ankle boot with a burnished, worn leather look and feminine flair. The top of the boot curves distinctively downward toward the back. Antique metal outer side buckle is etched with floral and geometric shapes. Has a rounded toe and low chunky heel. Zips up behind the ankle. Comfy and breathable with a textile lining. Pros: Rugged, attractive western boots with confidence and style to go around. They're right at home in the woods or in the city — Western ankle boots are the thing right now with short skirts and cropped flared pants. Cons: Some reviewers have indicated that they could use a little more padding on the inside. 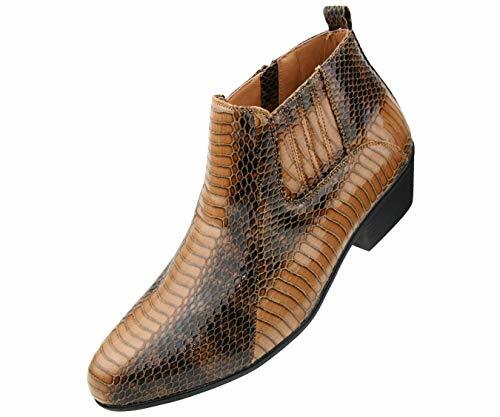 Striking men's dress-up demi boot with an allover brown and black snakeskin print. Has a black synthetic sole and a 1-1.5" heel. Pull tab at the back of the ankle assists in getting the boot on. Slip-on for as little fuss as possible. Pros: If you're in the market for something dressy but funky, these might be your new jam. Best matched with nice linen or otherwise good quality fabric pants. Cons: The outsole doesn't seem to be textured for traction. Dress-up or down women's white vegan leather bootie with a crisscross ankle strap and silver metal buckle on the outer side of the boot. Features cutout sides under the buckle straps. 2" block heel is contrasting black. Rubber outsole provides slip resistance. Supportive with a lightly padded insole. Pros: Great-looking, inexpensive summer shoes that go so well with billowy dress pants and crop tops. You could potentially get away with wearing these in the fall, especially if you pair them with fleece leggings. Cons: Not made to last a very long time.